Col del Mondo is an Abruzzese cantina making classical Trebbiano, Montepulciano & Cerasuolo d’Abruzzo wines from 12ha of vineyards near the village of Collecorvino, in the province of Pescara. The vineyards are located high up in sight of the Adriatic Sea, on the border with the Colline Teramane zone, on calcareous clay soils rich with (calc) stones in a recognised area called ‘Le Terre dei Vestini’. The property has been owned by the Mazzocchetti family for many generations, who started bottling their wines in 1973. Fabrizio Mazzocchetti (pictured left) is the latest generation to assume responsibility for the estate, along with his father Antonio. 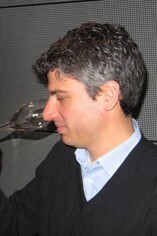 Notably Fabrizio learned his trade outside Abruzzo, attending wine school in Florence before working for while in Alto Adige. Fabrizio’s first vintage at Col del Mondo was in 2001 & since then he has worked hard to fine-tune the viticulture & vinification in an effort to produce even finer wines. The red Montepulciano d’Abruzzo is fermented in large cement tanks of 55hl (for natural stabilisation & micro-oxygenation) while the whites & rosati are made in stainless-steel. Affinamento (elevage) of the Montepulciano is in both large (slavonian) & small (French) oak.